If you are age 16 or older you may get a Hartland Public Library card. Fill out the online form and we will contact you when your card is ready. You may also come to the library to get a card. Children under age 16 may get a Hartland Public Library card. A parent or legal caregiver will need to complete the registration. At Early Literacy Storytime we read books, sing songs, learn new (and old) fingerplays, and we create and build! Children, from infants to age 5, and their caregivers are welcome. Join a lively group of conversationlists and hone your Italian language skills! All levels of experience welcome. Bring along your knitting or crafting project and we'll share ideas and good conversation. Code club is a weekly time when kids can come and learn how to make websites, video games, and apps. It’s informal, fun, and very interactive. Come have fun, make friends, and build cool stuff with us! Senior Activities at the Library, co-sponsored by Aging in Hartland and the Hartland Public Library. April's book title is Tribe by Sebastian Junger. Copies are available at the library. The book discussion is free and open to the public. "Combining history, psychology, and anthropology, TRIBE explores what we can learn from tribal societies about loyalty, belonging, and the eternal human quest for meaning. It explains the irony that-for many veterans as well as civilians-war feels better than peace, adversity can turn out to be a blessing, and disasters are sometimes remembered more fondly than weddings or tropical vacations. TRIBE explains why we are stronger when we come together, and how that can be achieved even in today's divided world." First-Friday Movie! Join us for a G or PG-rated movie - popcorn or another snack will be served. Understanding and Living with Vermont Black Bears a presentation with Forrest Hammond a wildlife biologist with Vermont Fish and Game. Come find out all you wanted to know about Vermont's black bear population. Each month we watch a short video, then discuss the ideas expressed by the author, presenter, or speaker. In April, we will watch an interview with George Monbiot, author of Out of the Wreckage. (Poetry like music connects all of us and pulls at our heartstrings). Do you want to continue practicing and playing with a welcoming group of ukulele players? A group of ukulele players of all abilities will meet on the last Wednesday of each month. 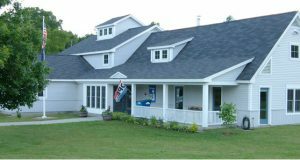 The Hartland Public Library is a focal point of the community, a gathering place for people of all ages. The purpose of the library is to provide free access to materials, resources, and programs for the educational, recreational, and informational needs of the community. The Hartland Public Library is located at 153 Route 5 in Hartland, Vermont. From I 91 use exit 9, then travel north on Route 5 for approximately one mile. We are located on the left side of the street, across from the Mobil station.